The Meredith and Eyre Tilt Bed Trailer Chassis is fitted with M+E manufactured heavy duty, low maintenance rubber torsion axles. 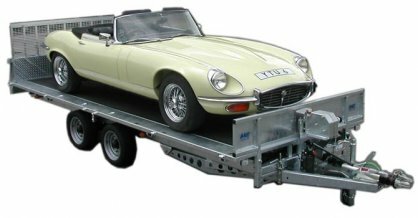 integral lashing points and deck rings, making these trailers suitable for the transportation of a wide range of on- and off-road cars and construction plant plus the day to day duties of a flat bed trailer. Loading is via the full width 3’ ramp, with gas assist, or by individual skids which are stowed securely and quietly underneath the platform. A total of 4 skids can be carried. The low platform height and reduced loading angle of only 12° makes for a versatile multi purpose trailer. The loading platform is further enhanced by having the spare wheel with 195/50 R 13C tyre and the hydraulic cylinder safely mounted under the floor. A Maintenance Safety Prop is provided for use when the platform is raised, for access to the under floor area. The trailers are fitted with full EC approved lighting system, including LED side marker lights, reversing lights and 13 Pin Electric Plug, with a converter for 7 Pin.